President Muhammadu Buhari, who resumed on Monday after a three-month medical vacation, is working from home. 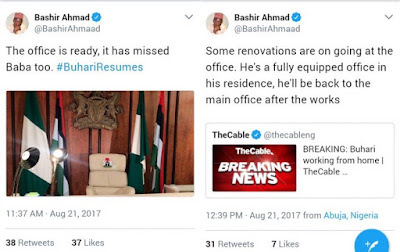 A presidential source disclosed this to TheCable but attributed the development to some renovations at the president’s office. The president had earlier signed a letter he wrote to notify the national assembly of his resumption. Abba Kyari, his chief of staff, witnessed the signing of the letter. Femi Adesina, special adviser to the president on media and publicity, also issued a statement to inform the public of the letter. 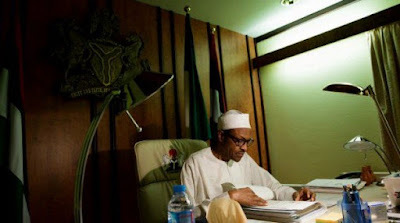 “In line with constitutional provision, President Muhammadu Buhari has written the national assembly, notifying the legislature of his return to office, after returning from medical vacation in London,” the statement read. “President Buhari had returned to the country on Saturday, August 19, 2017, and in a letter dated August 21, 2017, he told the Senate as well as the House of Representatives, that he was resuming office. “The letter stated in part: ‘In compliance with Section 145 of the 1999 Constitution (as amended), I write to intimate that I have resumed my functions as the President of the Federal Republic of Nigeria with effect from Monday, 21st August, 2017, after my medical follow-up in the United Kingdom’.